This month has seen an epic mile stone in comic history with the DC reboot. The entire universe has been torn down and rebuilt to clean up the time line and modernize each series. Last week series like Animal Man, Swamp Thing and Action comics have really made the most out of the reboot and given fans a new awesome take on old characters. From this week one of the titles which mostly stands out is Suicide Squad. Suicide Squad runs along the same theme as all the previous incarnations of the super villain team. The team still has the figure head leader Deadshot along with everybody’s favorite goth chick Harley Quinn, El Diablo, King Shark, Voltaic, Black Spider. The team start off on death row at Belle Reve after being captured individually with 31 other prisoners. From there they are given a chance for freedom by the government if they complete top secret missions. On the first mission the team are captured and tortured which is drawn and written as a masterpiece, I wouldn’t change anything. It’s also the first page I’ve seen “See Detective comics #1 on sale now” in, maybe the first of countless comic crossovers in the DCnU. 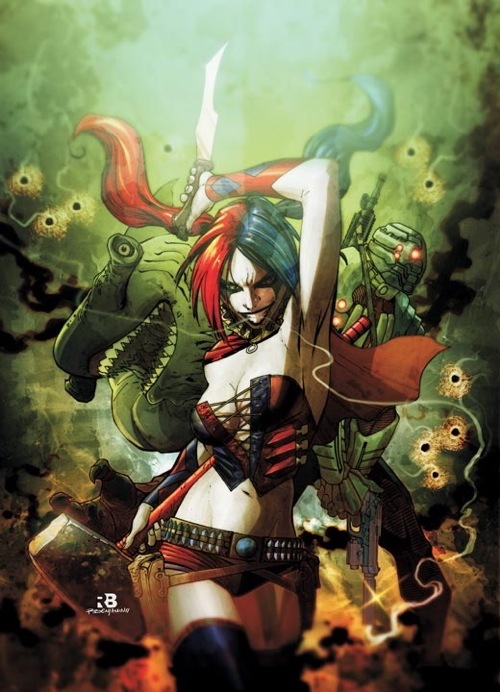 Compared to the others comics released in the DCnU it actually feels longer than it is> Where others so far have just teased with whats to come reading the first issue of Suicide Squad it almost feels like you have just finished a full TPB. Looking back on the DCnU 52 line up Suicide Squad would have been on the bottom of the buy list but it’s up there with Action Comics for pretty awesome start to a new series.